Oxford Public School Recruitment 2018 News: Check Oxford Public School Recruitment 2018 online in coming days till you can see old circulars. 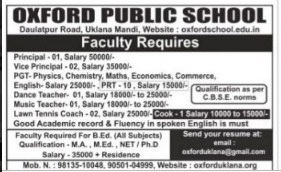 Earlier applications are invited for Principal, PGT, Vice Principal, Coach, Dance/ Music Teacher and TGT Jobs at Oxford Public School, Hisar (an English medium co-educational senior sec. school, affiliated to CBSE). Interested candidates have to apply online by email and broad cast advertisement of Oxford Public School Recruitment is given at www.oxforduklana.org. More information of Oxford Public School Recruitment regarding salary, qualification, logo image, experience and application process etc is mentioned below………………. 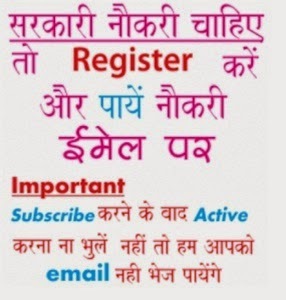 Candidates should be fluent in English and minimum 08 years of experience of CBSE schools. Candidates should MA/ MSC in relevant subject with B.Ed+ M.Ed/ M.A (Edu) + NET/ Ph.D and fluent in English. Oxford Girls College of Education, Hisar (affiliated to KUK, recognized by NCTE) requires Faculty as Assistant Professor Jobs. Interested and eligible applicants have to apply on or before 07 March 2015 at Oxford Public School, Hisar (an English medium co-educational senior sec. school, affiliated to CBSE). The Candidates should be MA/ MSC/ M.Com in concerned subject with 50% marks + B.Ed with 55% + M.Ed/ MA (Education) with 55% + Ph.D/ NET in concerned subject or education.